193 students received their Postgraduate Diplomas (PGDM) at the 22nd Convocation Ceremony of IFIM Business School on June 16th, 2018. “Skills acquired by the youth will be a defining factor in building a strong future for the country”- Dr. Kiran Mazumdar Shaw, Biocon Limited. 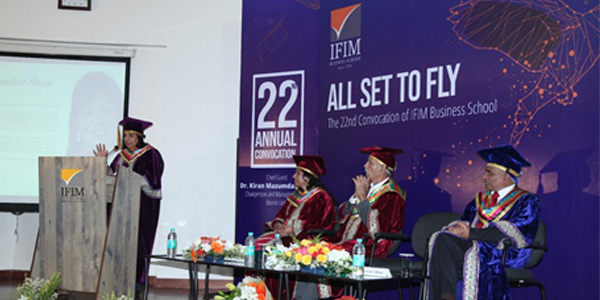 Bangalore’s No.1 Private B-School, IFIM Business School celebrated its 22nd Annual Convocation at their campus. This year, 193 students from the 2016-18 batch received their post-graduate diplomas in the presence of Chief Guest Dr. Kiran Mazumdar Shaw, CMD at Biocon Limited and the Guest of Honor, Dr. Bhimarya Metri, Director, IIM Trichy. The convocation was also attended by Mr. V B Padode, Chairman, Center for Developmental Education (CDE), and dignitaries from the corporate world, the Board of Governors of IFIM, the alumni of the Institute and proud parents of the graduating batch, which included both regular and executive PGDM students. Dr. Githa Hegde, who is the Director of IFIM Business School, acknowledged the needs for a sustainable future and how these are crucial times for the new generation. This B-School understands that the employment industry is ever evolving and it needs young professionals who can deal with the ever-changing needs of the world. IFIM equips its students with the skills they must have to become successful professionals who can evolve with the modern age along with the experiences and ability to adapt and bring about better innovations. The aim of IFIM is to nurture the leaders of tomorrow and redefine the way the game is played and what calibre of players are on the field. Nowadays, we are witnessing the genesis of technologies that are and will be further altering the way we live, work, and relate to one another. The scale, scope, and complexity of the transformation that humanity will undergo are unlikely to be like anything humankind has ever experienced before. 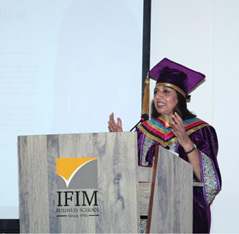 Dr. Kiran Mazumdar Shaw explained how she faced and learned from her failures in life. She started off just like anyone else as a 25-year-old entrepreneur with no business experience and limited financial resources. Like so many of us, she too had to face huge credibility and perception challenges, as well as, failures. She also recognised that in doing so she created nearly 10,000 direct jobs and several thousands of indirect jobs in the process! “As future professionals, you all need to understand that your country needs you. It needs capable and creative young people to be responsible for and address the myriad challenges that India is and will face in the years to come. We need to keep in mind that our country cannot aspire to something greater until we tackle problems like food security, health security, job security, energy security and environmental sustainability. The priorities at IIFM are straight. They emphasise training students in acquiring skills that make them continuously employable. The 22nd IFIM convocation concluded with lively celebration by the graduates who are now ready to go out into the world and start their new lives as productive and innovative professionals with the blessing of course of their proud parents and the institute that advanced them. • Renuka Mohta and Shubham Jain were exalted for their academic excellence as the top 2 all rounder’s. • The Best SIP Project went to the team responsible for the Assessing the impact of Air Pollution on the Health of auto Rickshaw drivers which comprised of Ajay Ballal, ImadUlHuq Kola, Poornima Yadav, Priya Georgina Cutinho, Rohan Bhaskar Shetty, Shodhan J Shetty and Vishwaroop Shetty. • The award for the Best Research incubation went to Moyukh Mukherjee and Shatakshi Agarwal. • And Samruddh P bagged the Best Industry Internship Program. IFIM Business School, one of the ‘Elite 6’ business schools in India with AACSB International accreditation, has been consistently ranked as ‘Bangalore’s No.1 Private B-School’. IFIM is the first B-School in Bengaluru and the sixth in the country to be internationally accredited by the Association to Advance Collegiate Schools of Business (AACSB), which is considered to be the gold standard in management education globally. This B-School offers three core programs that are AICTE approved — PGDM, PGDM-Finance (recognised by CFA Institute), PGDM- Marketing and PGDM-IB (International Business). IFIM Business School is accredited by South Asian Quality Assurance System (SAQS) and is also ISO 9001:2008 certified. Differentiators that propel IFIM in a stratosphere far above its peers in India include faculty with a perfect blend of industry and academic experience, international collaborations with American and European top B-Schools for faculty and student exchange programs and its internationally recognised curriculum. For more information about IFIM, visit www.ifimbschool.com/www.ifim.edu.in.